Phillippa’s book is based on her own children and is a beautiful story about a little brother owl who knows his big sister loves him very much. She hugs and kisses him every day. But Noah runs away, he thinks it’s just a game. This is a heartwarming tale of the loving bond between two siblings which has been beautifully illustrated. Phillippa kisses her children every day and believes that kissing is a meaningful and natural expression of love. She wanted to capture the beauty of this in a story that both children and parents could enjoy. Introducing a new book from young author and poet Peyush Gurung, The Song Of Life – 100 Random Poems. To purchase your copy scan the barcode below. Introducing the new title from author John Maris, The Spade, the story of an alert member of the public who had his life and that of his family changed having notified the police of the whereabouts of the hideout of the Great Train Robbers. Within days his notoriety had spread worldwide and this began years of constant pressure, physical threats to him and his family, trauma and anxiety. He had to take precautions at work in the hope of preventing an attack whilst working alone. Because of his careful detail in the evidence which he gave at the trial he was subjected to an attempt to frame him on a charge of perjury. Eventually he pondered the question, If a similar situation arose, would he act in the same way? Following the success of the X-rated I Blame Alfie! & the sequal I Blame Sophie! Ted Roudelle’s third book is on its way, I Blame Lisa! is to be released imminently. Having charted his foray in to the world of online dating in the first of his books, Ted carried on with his search for ‘Mrs Right’ in his second book, the conclusion of which he met his future partner, Lisa. I Blame Lisa! starts at the wedding and charts the first year of life together with Lisa in a story that is worthy of a TV series, to give you a clue as to what is to come in this book, the sub-title to this next chapter in Ted’s life is “…For attempted murder, mayhem and mob rule on a caravan site in the royal town of Windsor”. To be released in the next few days, watch this space! Introducing the new title from archivist and researcher Tom Askey, his new book “Lance Thackeray His Life & Art”. Lance Thackeray 1867-1916 is known as a designer of humorous postcards whose wit and elegance have never been surpassed. He was far more than that. In his short lifetime he produced sketches, pastel drawings and watercolours of great skill and beauty, now seldom seen. Had he lived to old age he would surely have become a major English artist. Sadly he died during the First World War. Sociable yet self-effacing, he has eluded wider recognition. A bachelor leaving few personal traces, no full account of his life and art has previously appeared. In his centenary year this book is timely. 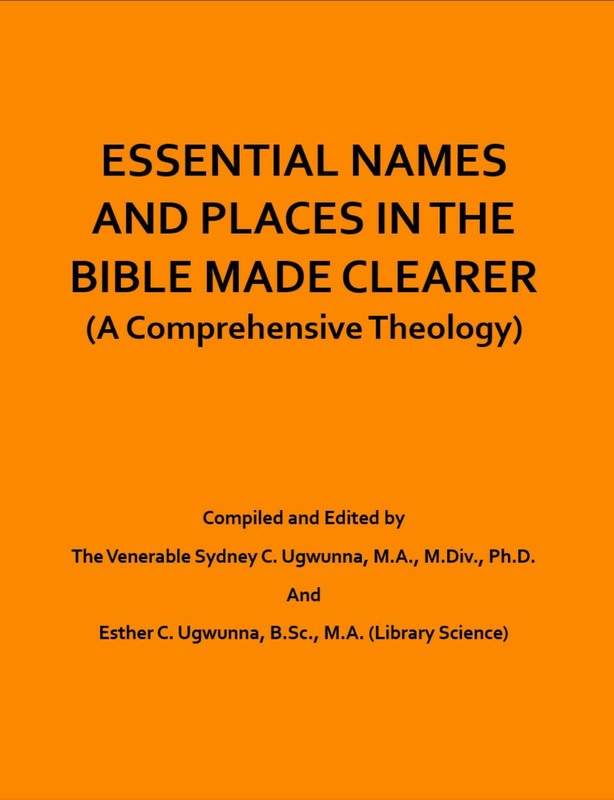 Introducing the second title “Essential Names & Places In the Bible Made Clearer” from The Venerable Sydney C. Ugwunna, M.A., M.Div., Ph.D. in association with Esther C. Ugwunna, B.Sc., M.A.,. Sources of information for this Compilation are primarily the Holy Bible, Old and New Testaments, Authorized King James Version. No other references or bibliography are listed in this Compilation except those directly from the Bible. All important references and quotations come from the Bible. Secondary sources are Seminars held, in the course of many years, by many world renowned Biblical Scholars from many parts of the world, in which the Editors of this Compilation (Dr. Sydney and Esther Ugwunna) participated. Other sources include oral conversations between many Biblical Scholars from many nations and Dr. Sydney Ugwunna. Extremely important sources were also derived from the writings of the world renowned Theologian and Bible scholar, Dr. Gilbert James Brett. Thus, this book is simply a compilation and editorial work (by Dr. Sydney and Mrs. Esther Ugwunna), of works already in existence. They are not claiming authorship. This Compilation, therefore, is not an original work, in that sense. For more information on this title and to purchase your copy click here. Also available at other stockists.